It is unclear at this time the name of the suspect, who sources said was being held at the Road Town Police Station. The man was; however, later recaptured. This information was confirmed by Police Information Officer Diane Drayton late last evening. “The prisoner has been recaptured,” Drayton told this news site. It was on April 28, 2017 that St Kitts native Olanzo Dore, 31, escaped lawful custody while on Virgin Gorda. 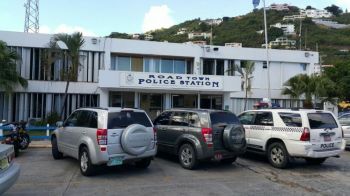 The incident took place when the prisoner was being taken to board a ferry for Tortola after making an appearance at the Magistrate's Court on Virgin Gorda and being placed on remand. Mr Dore, however, turned himself in on May 1, 2017. He has since been charged with escaping lawful custody. Wa did the burglar said to himself? I can easily escape from these police. Come on...how do you all intend to serve murders if y'all can't even retain a bulglar? The public usually gets the blame for not sharing information with the police: my goodness the police cant even safeguard themselves: one fellow ran away from the some day ago from police while coming from VG: man going in the police station and stealing bikes: the police good at traffic tickets!!!! Talk that??? why yu ah stop poor people from eatin ah food?